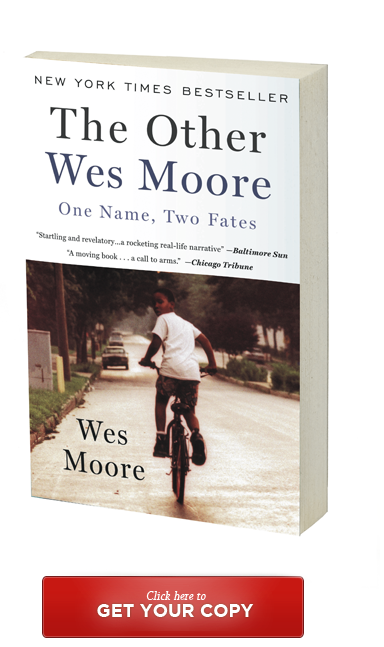 Lately, I’ve been thinking a lot about Wes Moore’s memoir, The Other Wes Moore: One Name, Two Fates. If Moore’s memoir had not actually happened, it would be a neat parable of two radically different lives that originated at the same starting point. But this is not a There but for the Grace of God Go I story. Moore’s story may appear to be the very embodiment of the symbiotic relationship between fate and choice. But really this is a story about locating and then tapping into free will to beat the odds. Here’s the book’s stark premise: Around the time that the author Wes Moore became Johns Hopkins University’s first Rhodes Scholar in 13 years and the university’s first-ever African-American Rhodes scholar, another Wes Moore—a contemporary—was wanted for the murder of a police officer in an armed robbery for which he would eventually go to jail for life. That was 2000. The two men grew up in the same tough West Baltimore neighborhood, but irony does not hang over this book like a dark cloud. Wes Moore, the author, went to Oxford, was a decorated war hero who served in Afghanistan and was a White House Fellow. And yes, the other Wes Moore is serving a life sentence without parole and became a grandfather at the age of 33. Two paths began at the same point, but diverged. The road taken, the road not taken—each of them men spent time on both roads. The Wes Moores converge on the same destination. Through prison visits and letters, the two Moores bared their souls to one another and laid out their lives side by side. Poverty was both the level playing field and the catalyst that propelled these two men in opposite directions. Both of them grew up without their fathers—author Wes’ father died when he was four, prisoner Wes never met his father. Both were grief stricken. But one mourns the death of a loving father, while the other seethes over his absent one. The author’s mother was a teacher who kept careful track of her son’s growing apathy toward school and attraction to life on the streets. She moved her family to the Bronx when Wes was a young teenager to be near loving grandparents at the ready to help Wes and his sisters. Wes won a scholarship to Riverdale Country Day School, but he couldn’t connect to his rich white classmates. He missed school and failed most of his classes. The Rhodes Scholar Wes Moore had a mother who never gave up on him. She bought her son Mitch Albom’s book about a Michigan basketball team, and his spark for reading caught on fire. She scraped together tuition money to send him to a military school in Pennsylvania where he thrived and became one of the youngest officers in the history of the school. The other Wes Moore’s mother did her best to protect Wes from the streets. She did that and more while trying to make rent and put food on the table. It’s heartbreaking that when someone bothered to teach the other Wes Moore to read, he soared up to college level. There were other aching near misses in the other Wes Moore’s life. His mother enrolled at Johns Hopkins in the early 80s, determined to get an education that would have propelled her into the middle class. Government cuts abruptly ended her college career. Wes himself went through a year-long Job Corps program, earning high scores on his GED and training as a carpenter. But there was no job to be had afterwards, and the money to be made on the streets was too tempting. You may be thinking “The Other Wes Moore” sounds like a fascinating story—an important call to arms to reform society—even offering a comprehensive appendix of resources at the end of the book to help at-risk youth. You may also wonder if these men’s stories have resonance for a reader beyond the book. I lived in Baltimore for five years during the 90s. My husband worked at Johns Hopkins Medical School in rough, jagged West Baltimore. When I drove through those streets, I was always overwhelmed by the stories I didn’t know. And I’d think about one of my favorite quotes from Rabbi Hillel of the Talmud: If I am not for myself, who will be for me? If I am not for others, what am I? And if not now, when? This entry was posted in books, culture, family life, Parenting by judy bolton-fasman. Bookmark the permalink. The real question here is “what was the difference between the mother of Wes1 and Wes2?” I am sure that the answer is EDUCATION.